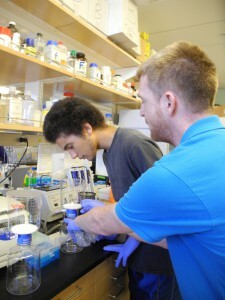 This week’s BEACON Researchers at Work post is by University of Washington graduate student Bryan Bartley. Like some kind of planktonic larva, I drifted through my formative years, until I finally settled in Seattle 14 years ago. Seattle belongs to a great metropolis situated amidst mountain ranges, evergreen forests, and a great maze of waterways called Puget Sound. For those of us who call this place home, Puget Sound is a natural wonder and source of vitality. We share our home with diverse species of wildlife, fish, seabirds, and marine mammals. Marine invertebrates shaped like aliens are strategically poised to invade Seattle from the city’s shorelines, their invasion checked only by the rising tide. There are signs the world inhabited by these creatures is rapidly changing. Temperatures around Puget Sound are warming faster than the global average, while a number of human-caused factors, including carbon emissions, are impacting water quality and habitat. Critical species of salmon and shellfish, which are central to the cultural and economic identity of our region, are already threatened. The citizens of Puget Sound, regardless which branch they occupy on the tree of life, must learn to recognize, manage, and adapt to this rapidly changing world. No one can deny that our world is rapidly changing. Stocks are traded at the speed of light. Planes span the globe in a few hours. Everywhere you look, the pace of life is speeding up. Given how easily the effects of our actions spread across the globe, we must consider the larger consequences of our actions. We must begin to think like citizens of a planet. I want the citizens of tomorrow to think like scientists as they face the future. That is why I helped organize a collaboration between citizen scientists at the Seattle Aquarium and educators from BEACON. The Aquarium’s Citizen Science program actively involves high school students in surveying biodiversity and intertidal habitat around Puget Sound for long term conservation management. The intertidal ecosystem becomes a classroom in which students learn how to ask scientific questions, systematically collect observations about the natural world, and construct arguments based on their observations. Together with BEACON we are enhancing the educational impact of this program by disseminating and developing curricular resources, training teachers at workshops, and creating research opportunities for high school interns in marine biology labs at UW. In order to characterize plankton communities in Puget Sound water samples, we size-fractionated, concentrated, and collected them on filters. DNA was extracted from the filter and the genetic sequence used to ID organisms. As a graduate student, I started volunteering with the Citizen Science program because I wanted to find better ways to promote scientific thinking. I enjoy the camaraderie with students while conducting beach surveys and working together toward a scientific objective. While on the beach, we also get to witness the dramatic interplay between landscape, elements, and life on the edge in the intertidal zone. Some of our high schoolers become excited about science during their experience in the Aquarium’s beach monitoring program. Last summer, I and some fellow BEACON graduate students mentored some of these students in summer research projects. For their project, my summer interns isolated microscopic plankton from the Sound, sequenced their DNA, and used their genetic sequences to build phylogenetic trees showing how they are evolutionarily related. But my biggest reward is the impact the program has on attitudes and values in my community. The Citizen Science program promotes community ecoliteracy and activism through its network of students, families, teachers, adult volunteers, and aquarium staff. 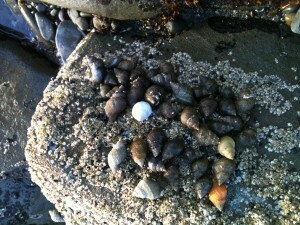 Even the most jaded students find it hard to be bored by the diversity of life forms they discover on our shores. These encounters are opportunities to teach kids about the ecological and evolutionary relationships that connect all life on earth. I believe that experiences like this cultivate a connection to and respect for life that transcends cultural boundaries. In my graduate research, I use science to explore my connection with life. From what you’ve read, you might think that I am probably studying to be a marine biologist, so you might be surprised to discover that I am actually training to be an engineer. While I certainly enjoy getting outside and studying organisms in their natural habitat, I spend more time in the lab or at a computer than I do outside! In my research, I use computers to model complex living systems, such as the biochemical reactions inside a cell. Is it possible that living systems on all scales, from cellular metabolism all the way up to ecosystems, share some common principles? Though still a controversial topic, I think so! I like to study the principles of living systems, whatever their scale, and think about how those principles might be applied to engineer better artificial systems. For example, economists and business leaders could learn a lot about “sustainability” by studying the famous Krebs cycle of primary metabolism, which you might have studied in an introductory biology course. This cycle of biochemical reactions is so useful that it is found universally among oxygen-respiring life on earth, and it can flexibly juggle diverse inputs and demands under very different conditions in order to maintain a stable equilibrium. I imagine it as a logistical hub that coordinates a complex network of supply chains and manufacturing pipelines. It is interesting to think about analogies like this across different scales of living systems. 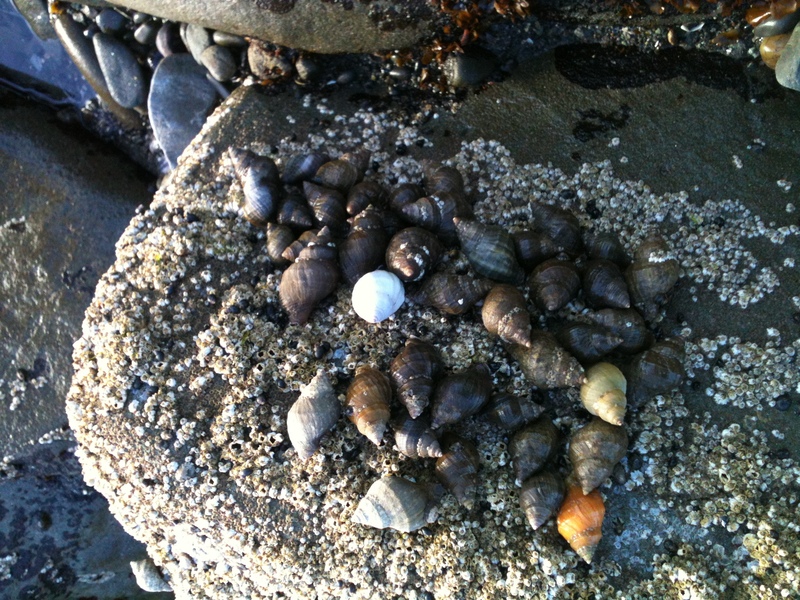 Aggregations of intertidal snails like these have been hypothesized to be self-organizing systems. I am eager to find ways to collaborate with others in BEACON who see an opportunity to teach kids the principles of living systems in the context of an ongoing, ecological field study. For example, it would be fun to use AVIDA-Ed in classroom activities to explore concepts related to ecological resiliency and sustainability, along themes discussed by Fortuna, et al in their paper “Evolving Digital Ecological Networks.” This kind of systems-level thinking is promoted in Washington state’s educational standards, but so far there aren’t very good curricula available for teachers. Not only that, but I also believe that this kind of systems-level perspective is extremely important as kids grow up in a world full of complex issues, including climate change. Another interesting question about living systems that I have been considering recently is what’s called a bi-level optimization problem. It asks, can we find ways to use the resources from a living system that maximizes our own personal good but also benefits the overall fitness of the system? I have found at least one answer to that question. From my perspective, the opportunity to work with the students in the Citizen Science program, my BEACON partners, and the Seattle aquarium has been a win-win all around. For more information about Bryan’s work, you can contact him at bbartley at uw dot edu. This entry was posted in Uncategorized and tagged BEACON Researchers at Work, Biological Evolution, citizen science, Conservation Biology, Education, Engineering, Field Biology, high school students, phylogetics. Bookmark the permalink.